Here is how the Lancia Delta would look badged as a Chrysler. TURIN -- Fiat S.p.A. will assemble two models for the Chrysler Group in Italy, including the next-generation Sebring mid-sized sedan, Fiat sources revealed Wednesday. Under the Italian automaker's five-year plan, Fiat and Chrysler will manufacture more vehicles for each other than previously revealed. The manufacturing plan is part of a larger effort to weave together the companies' product development, purchasing and other operations for maximum efficiencies of scale. • In 2013, Fiat will build in Turin a mid-sized sedan “that will be primarily produced and distributed for Chrysler in the U.S.,” Marchionne said. A person familiar with the matter said the car will replace the Sebring. • In 2012, Fiat will build in Italy a new compact sedan, which will be distributed in North America under the Chrysler or Dodge brand. • Alfa is planning a rear-drive roadster for 2013. The car could be built in Canada or Italy. • Chrysler will build in the United States two Alfa Romeo SUVs for global sales -- a compact model in 2012 and a larger model in 2014. 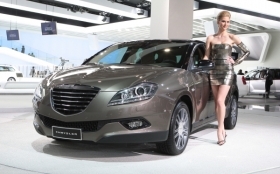 • Chrysler could import from Serbia new, Fiat-built subcompacts in 2013 for both the Chrysler and Dodge brands. Marchionne wants to use existing factories as efficiently as possible. “The allocation of production between Fiat Group Automobiles and Chrysler will be based on rationalization and efficiency so that maximum capacity utilization is achieved for both organizations and the need to establish new plants avoided,” he said. • Chrysler will build in the United States the compact SUV for Alfa along with the vehicle that will replace the Jeep Patriot and Compass crossovers. • The large Alfa SUV and Jeep Cherokee replacement, sold as the Liberty in the United States, will share the same U.S. plant. • The Chrysler Sebring sedan will be built in the Mirafiori plant in Turin, along with the Alfa Romeo Giulia mid-sized sedan and wagon. • The new compact Chrysler or Dodge model will be built in Fiat's Cassino plant in central Italy. By 2014, Cassino will build 400,000 units on the same platform, including the Alfa Romeo Giulietta, the Fiat Bravo replacement and the Lancia Delta. • Next year, the Mexico-built Dodge Journey crossover will become a Fiat model in Europe. • Beginning next year, five Chrysler North American-built vehicles will be sold in continental Europe with the Lancia badge. But in the United Kingdom and Ireland, the Chrysler badge will be used on all Lancias and Chryslers. Lancia withdrew from those right-hand-drive markets in 1991 because of poor sales. • The Ram truck brand's unibody pickup, due in 2012, will be sold in Europe under the Fiat Professional brand of light commercial vehicles. The North American range of the Fiat brand will include four models: three variations of the 500 minicar built in Mexico -- a hatchback, convertible and Abarth sporty version -- and a four-door high-roof hatchback built in Turin. • A Canada-built new 300C large sedan in 2011. • A Canada-built restyled Voyager large minivan in 2011. The van is sold as the Town & Country in the United States. • A U.S.-built new compact sedan in 2012. • A U.S.-built compact hatchback/station wagon in 2012.